The following discussion is about the Olive Green jac-shirt designed for Scouts. This jac-shirt has been discontinued. Another page will show, for BEST uniforming, where various pieces of insignia are to be placed on these and other jackets. In 2002, the BSA introduced the "Centennial" Scout uniform using the color scheme of olive green and brown-tan. This is the current field uniform of the BSA. In connection with this, they announced that the color "Scouting Red" long used as part of insignia and uniforming items would be retired; newer items will be in a green color. Way before this change, many Scouters, especially those living around or on military installations around the world, have been using camping and outdoor material rooted from the military. The military's ground color of olive green (or OD green) stood the test of time and allowed for general camoflauge of many of those materials. Machiney, to include combat and combat support equipment was painted in that green color, supplemented by brown and a lighter green color, to aid in that "hiding". The military contracted in the middle 50s to develop an outer jacket which is the forerunner to the BSA's jac-shirt. 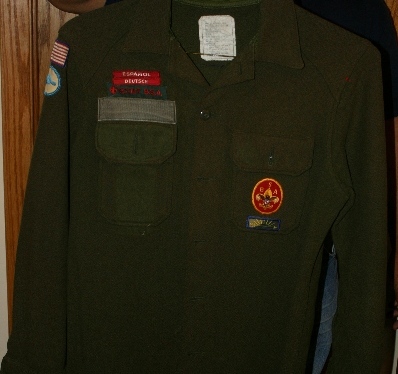 In the late 60s and throughout the 70s, those wool jac-shirts were converted to cheap Scouting jac-shirts, with Scouting insignia placed on the jac-shirt in a similar manner as the BSA's official jac-shirts featured. Scouts and Scouters loved it and used it as a substitute for the pricier red jac-shirts. Woolrich also designed and manufactured this version of the jac-shirt, as they did for all of the other earlier versions. 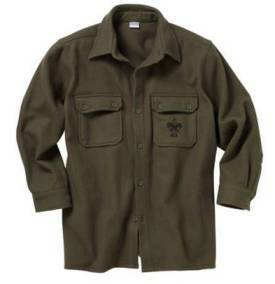 Unfortuately, the Woolrich company did not design/manufacture the olive green jac-shirt introduced in 2003. This jac-shirt was manufactured overseas (Indonsia) and was immediately panned by Scouters and Scouts. There was nothing wrong with the jac-shirt; on the contrary, the material used in this version stood up better to spills, was a bit more waterproofed than the older jac-shirts, and as a heavy jacket, it was acceptable. Scouters and Scouts were upset at two major items: where the jac-shirt was made and the large BSA emblem "screened" over the left pocket. The BSA''s olive green jac-shirt. I don't have a photo of the backside. 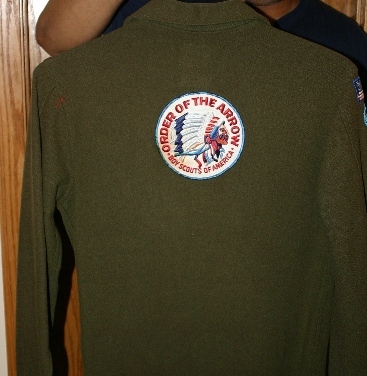 At any rate, the jackets did not sell well at all; and in 2009, the BSA officially took the olive green jac-shirt off the Supply Group's catalog. There are still extra small, small and extra large and 2X versions out there in some local stores but for the most part they are gone and done.